The LIC-IDBI deal met with a speed-breaker on Tuesday after the Delhi High Court asked the life insurer to give reasons for relaxing investment regulations for the stake buy. The development, however, did not hold back IDBI Bank from calling for a shareholder’s approval to issue up to 14.9 per cent equity to LIC through preferential shares. The court has asked LIC how it was not bound to follow investment regulations of 2016 which limit exposure to 15 per cent in an investee company. LIC told the court that it will not take any steps till August 30 towards its proposed acquisition of 51 per cent stake in IDBI. 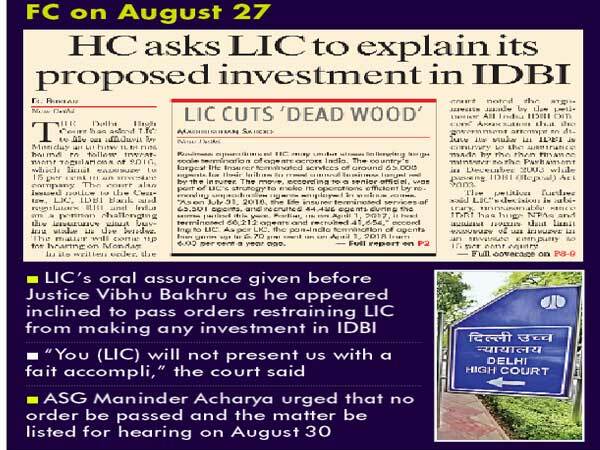 The oral assurance by the LIC was given before Justice Vibhu Bakhru as he appeared inclined to pass orders restraining LIC from making any investment in IDBI in which the government intends to dilute its shareholding below 51 per cent. “You (LIC) will not present us with a fait accompli,” the court said after which additional solicitor general Maninder Acharya, appearing for the Centre and LIC, urged that no order be passed and the matter be listed for hearing on August 30 as till then nothing will happen. He also sought time to file an affidavit indicating the reasons behind the government and LIC's decision. The court gave LIC time till August 30 to file the affidavit in which the insurance company was asked to also indicate its board's minutes of meeting and agenda papers pertaining to the proposed investment in the IDBI. The order came on a plea moved by the All India IDBI Officers Association which has challenged the LIC's move to acquire 51 per cent stake in the bank. The finance ministry sources said the deal has to move on parallel along with court case as there are important approvals yet to come and the IDBI Bank regulatory capital breach is looming large. Life Insurance Corporation of India (LIC) will purchase 14.9 per cent equity stake in IDBI Bank, inching towards majority ownership in the lender. Since LIC and IDBI are yet to get major approvals, as a first step the standard 15 per cent equity acquisition will happen which just needs IDBI shareholders’ approval. As the financial position of IDBI bank becoming weaker with a over Rs 55,000 crore gross NPA and the government no longer willing to put capital in IDBI, the infusion of capital by LIC had become necessary. FC had earlier reported that in view of IDBI’s precarious position, the finance ministry had asked LIC to pull up socks to give capital to IDBI Bank by speeding up the process and procedures pending approvals. The court also asked for financial details of both LIC and IDBI Bank as the petition has claimed that "the acquisition is not a financially prudent decision for the LIC given the fact that IDBI Bank has gross non-performing assets amounting to a whopping Rs 55,588.26 crore . The petition also said that the change in shareholding was not in public interest as it "exposes the investments made by the public in the IDBI and corrodes the ability of the LIC to pay back its policy holders since it will have to invest an amount of Rs 13,000 crores to acquire the 51 per cent stake".